We are dedicated to promote Yemeni Culture not only inside to Yemen for our visitors but also outside of Yemen. 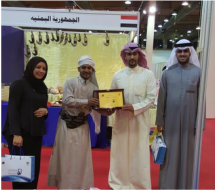 We represent Yemeni promoters and internationally experienced Yemeni exhibitors who participate international fair trade shows, expo and other exhibitions. Please if you need any other information feel free to contact us by e-mail easyyemen@easyyementours.com or by phone (+967 716596200) or Whatsapp.